For other uses, see Ampere (disambiguation). 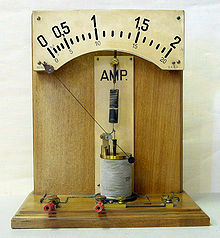 The ampere (/ˈæmpɪər, æmˈpɪər/; symbol: A), often shortened to "amp", is the base unit of electric current in the International System of Units (SI). It is named after André-Marie Ampère (1775–1836), French mathematician and physicist, considered the father of electrodynamics. The ampere is that constant current which, if maintained in two straight parallel conductors of infinite length, of negligible circular cross-section, and placed one metre apart in vacuum, would produce between these conductors a force equal to 6993200000000000000♠2×10−7 newtons per metre of length. 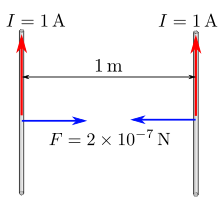 Ampère's force law states that there is an attractive or repulsive force between two parallel wires carrying an electric current. This force is used in the formal definition of the ampere. Constant, instantaneous and average current are expressed in amperes (as in "the charging current is 1.2 A") and the charge accumulated, or passed through a circuit over a period of time is expressed in coulombs (as in "the battery charge is 7004300000000000000♠30000 C"). The relation of the ampere (C/s) to the coulomb is the same as that of the watt (J/s) to the joule. The "international ampere" was an early realization of the ampere, defined as the current that would deposit 6997111800000000000♠0.001118 grams of silver per second from a silver nitrate solution. Later, more accurate measurements revealed that this current is 6999999850000000000♠0.99985 A. Since power is defined as the product of current and voltage, the ampere can alternatively be expressed in terms of the other units using the relationship I=P/V, and thus 1 ampere equals 1 W/V. Current can be measured by a multimeter, a device that can measure electrical voltage, current, and resistance. The standard ampere is most accurately realized using a Kibble balance, but is in practice maintained via Ohm's law from the units of electromotive force and resistance, the volt and the ohm, since the latter two can be tied to physical phenomena that are relatively easy to reproduce, the Josephson junction and the quantum Hall effect, respectively. Rather than a definition in terms of the force between two current-carrying wires, it has been proposed that the ampere should be defined in terms of the rate of flow of elementary charges. Since a coulomb is approximately equal to 7018624150930000000♠6.2415093×1018 elementary charges (such as those carried by protons, or the negative of those carried by electrons), one ampere is approximately equivalent to 7018624150930000000♠6.2415093×1018 elementary charges moving past a boundary in one second. (7018624150930000000♠6.2415093×1018 is the reciprocal of the value of the elementary charge in coulombs.) The proposed change would define 1 A as being the current in the direction of flow of a particular number of elementary charges per second. In 2005, the International Committee for Weights and Measures (CIPM) agreed to study the proposed change. The new definition was discussed at the 25th General Conference on Weights and Measures (CGPM) in 2014 but for the time being was not adopted. The current drawn by typical constant-voltage energy distribution systems is usually dictated by the power (watt) consumed by the system and the operating voltage. For this reason the examples given below are grouped by voltage level. Most Canada, Mexico and United States domestic power suppliers run at 120 V.
Most European domestic power supplies run at 230 V, and most Commonwealth domestic power supplies run at 240 V. For the same amount of power (in watts), the current drawn by a particular European or Commonwealth appliance (in Europe or a Commonwealth country) will be less than for an equivalent North American appliance. [Note 1] Typical circuit breakers will provide 16 A.
so it follows that if the voltage is doubled and the power remains the same, the current will be halved. ^ SI supports only the use of symbols and deprecates the use of abbreviations for units. "Bureau International des Poids et Mesures" (PDF). 2006. p. 130. Archived (PDF) from the original on 21 June 2007. Retrieved 21 November 2011. ^ Base unit definitions: Ampere Archived 25 April 2017 at the Wayback Machine Physics.nist.gov. Retrieved on 2010-09-28. ^ Serway, Raymond A; Jewett, JW (2006). Serway's principles of physics: a calculus based text (Fourth ed.). Belmont, CA: Thompson Brooks/Cole. p. 746. ISBN 0-53449143-X. Archived from the original on 21 June 2013. ^ a b Beyond the Kilogram: Redefining the International System of Units, US: National Institute of Standards and Technology, 2006, archived from the original on 21 March 2008, retrieved 3 December 2008 . ^ The International System of Units (SI) (PDF) (8th ed. ), Bureau International des Poids et Mesures, 2006, p. 144, archived (PDF) from the original on 5 November 2013 . ^ a b "Appendix 2: Practical realization of unit definitions: Electrical quantities", SI brochure, BIPM, archived from the original on April 14, 2013 . ^ "Value", Physics, US: NIST, archived from the original on 24 April 2015 .